Last week, Sean and I traveled to Detroit, Michigan — courtesy of Ford — to attend the North American International Auto Show as well as Ford’s Design & Innovation Fantasy Camp. Throughout this week, I’ll be sharing some of the things I learned with you, not only about Ford as a company, but about the changing face of new media and innovation and creativity as well! Seeing the technology that Ford is using — both in their cars and behind the scenes — was a bit like seeing into the future. Except it’s not the future; it’s the technology of today! Hear the weather, stock news, etc. In addition, My Ford Touch offers an 8″ color touch screen so that you can access your radio, thermostat and more easily. Technology isn’t just being used to keep us connected or add fun features; it’s also being used to make Ford cars safer. The MyKey system may be my most favorite development, especially as the thought of our four girls driving is already likely to give me a panic attack. With MyKey, which comes standard on most Ford vehicles, parents can actually limit the radio volume as well as the car’s speed. While speed and volume are not the only causes of teen accidents, they certainly play a role in many of them, and limiting these can help teens be more aware and safer on the road. In addition, the 2013 Ford Fusion will include Lane Departure Warning technology that uses a dash-mounted camera to detect lane markers. When the driver drifts over those markers, the steering wheel will rumble — like classic rumble strips. In addition, if the lines are crossed too often, the car will actually sound an alert and suggest via a coffee cup symbol on the dash that the driver take a break from driving! That’s all really exciting stuff, and I can only imagine what other features will be released in the years to come, but getting a glimpse behind the scenes revealed some pretty incredible technology as well! 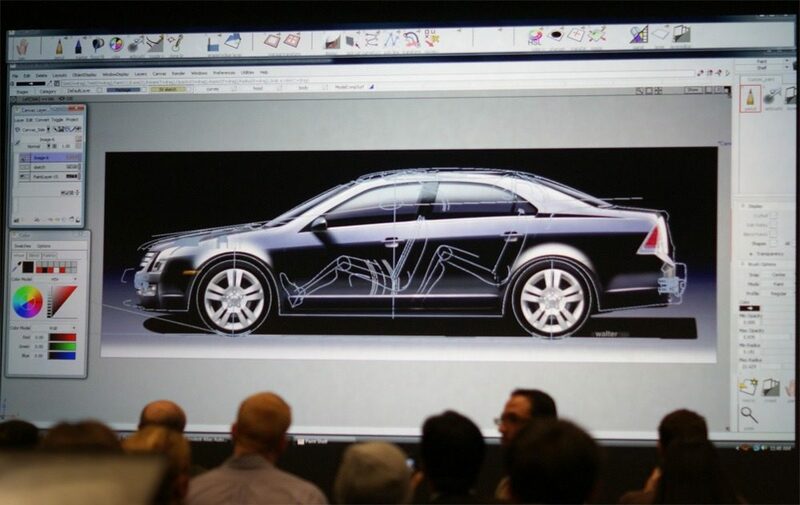 For instance, the car on the screen above is actually a digital model. You wouldn’t know that by looking at the smaller screen, and you still couldn’t tell when it was projected on the huge screen at the front of the room. In fact, many car commercials today use digital renditions of vehicles! I know I’m not the only person who is tempted to see if I can figure out which are which on TV now. It was also really interesting to see how Ford is blending new and old technologies in the development of their cars. 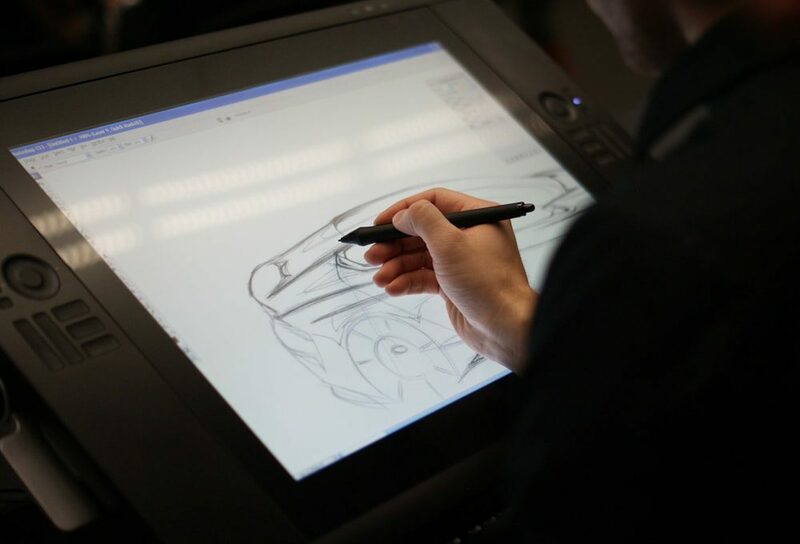 They have digital labs where designers sketch cars, play with colors, test reflections digitally and more, but they also still use clay to create initial designs as well as full-size models of the cars they’re working on. The clay cars (which we were unfortunately not able to take pictures of) seemed primitive compared to the digital lab, and at the same time, there’s an incredible artistry that goes into designing a car by hand, shaping it with tools and seeing it come to life in front of you. On the other hand, the digital tools we saw were mind-blowing. 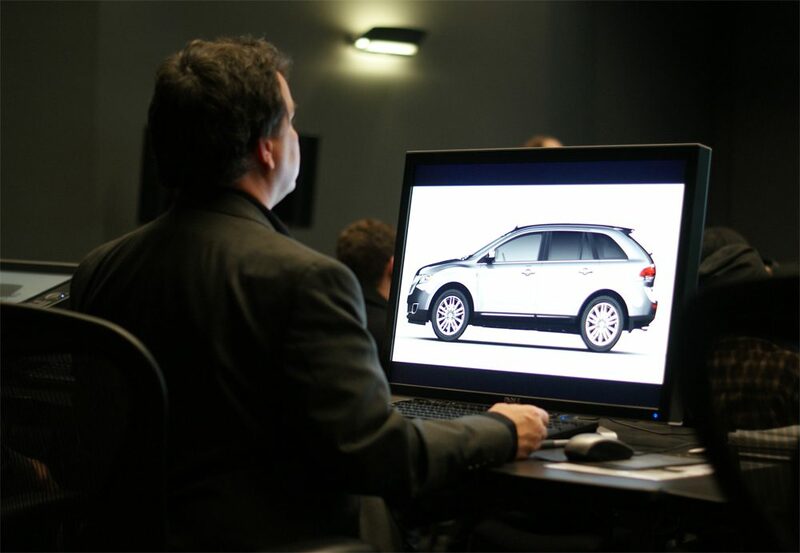 For example, we were able to see how they use incredibly powerful cameras to capture light, colors and reflections so that they can see how the cars they design will look in various environments. There’s no doubt that technology is having a huge impact in this industry — both from a consumer’s standpoint and a designer’s — and I’m not sure I’ll ever look at a car quite the same way again! What technology do you think we’ll see in the cars of the future? Ford invited us to Detroit and provided travel and accommodations. In exchange, they asked us to cover the event on our blogs; however, I walked away with so much more to share with you than I expected. All opinions — and the decision to write an entire series about our experience — are 100% mine! Next PostFREE Webinar Reminder: Is Time Out a Waste of Time?